Color Wheels Color Wheel Co.
A visual guide to color mixing that illustrates color relationships through a series of windows and color tones on a moveable wheel. 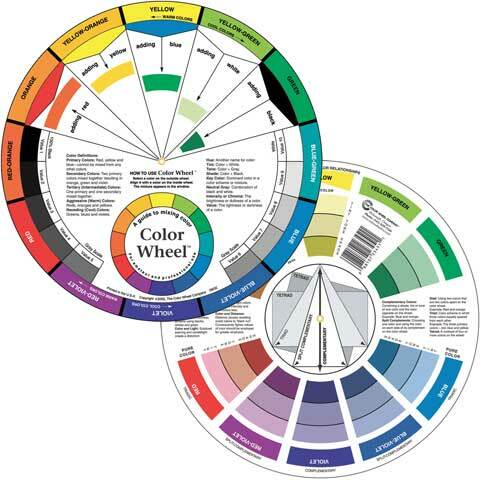 This wheel provides the user with information such as harmony within color relationships, complementary colors, variation of tones and the triadic approach to colors. The front of the wheel shows the result of mixing primary the primary, secondary and tertiary colors with the primaries plus black and white. The back of the wheel shows color relationships, tints, tones and shades. The wheel includes a gray scale and definitions of common terms. The wheel is 9-1/4" in diameter.